It has been widely reported that during the past year a German man with an HIV infection was apparently fully cleared of the infection after receiving blood transfusions, in therapy for an unrelated case of leukemia, from a donor who had a particular genetic mutation affecting immune system cells. Upon investigation, the nature of the mutation was determined. It has now been functionally reproduced and used in experimental trials with other HIV patients. The mutation affected the CCR5 receptor of T cells, which is used by HIV to infect the cells and compromise the immune system. 15 experimental subjects had T cells removed and treated with a zinc finger nuclease to disable their CCR5 receptor gene. The cells were then reintroduced in the subjects. 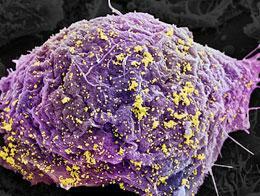 In some cases, modified cells persisted for up to 6 months. In one case, the subject stopped taking antiretroviral drugs. HIV returned at first, but it eventually dropped to undetectable levels. Although this is a very preliminary result, and certainly not yet an effective therapy, it seems to show that researchers are on the right track. This past year, a Berlin man, Timothy Brown, became world famous as the first—and thus far only—person to apparently have been cured of his HIV infection. Brown’s HIV disappeared after he developed leukemia and doctors gave him repeated blood transfusions from a donor who harbored a mutated version of a receptor the virus uses to enter cells. Now, researchers report promising results from two small gene-therapy studies that mimic this strategy, hinting that the field may be moving closer to a cure that works for the masses. HIV, the AIDS-causing virus, is a master of eluding the body’s immune system – in part because it targets cells of the immune system itself as part of its reproductive strategy. This makes development of vaccines to protect against HIV especially difficult, because vaccines require a functioning immune system in order to work. If HIV escapes early immune system defenses, later defenses may fail. The first modestly encouraging clinical trial of an anti-HIV vaccine was announced two years ago. Frustratingly, however, it was not clear how the vaccine involved actually worked. Scientists are still studying blood samples from trial participants to search for differences that might explain why the vaccine worked for some but not for others. So far two antibodies have been identified that target different HIV antigens – one antibody that is associated with more successful results, and the other with less successful ones. These are the first clues ever found that seem to point towards a successful HIV vaccine mechanism. Researchers are already planning to test whether antibodies like those found in trial participants have the same effect in primates infected with a virus related to HIV. These experiments will determine whether these immune responses are responsible for the vaccine’s success or failure in particular people or merely linked to other underlying factors.